"Gif Blocker" blocks GIF images if the extension is enabled. 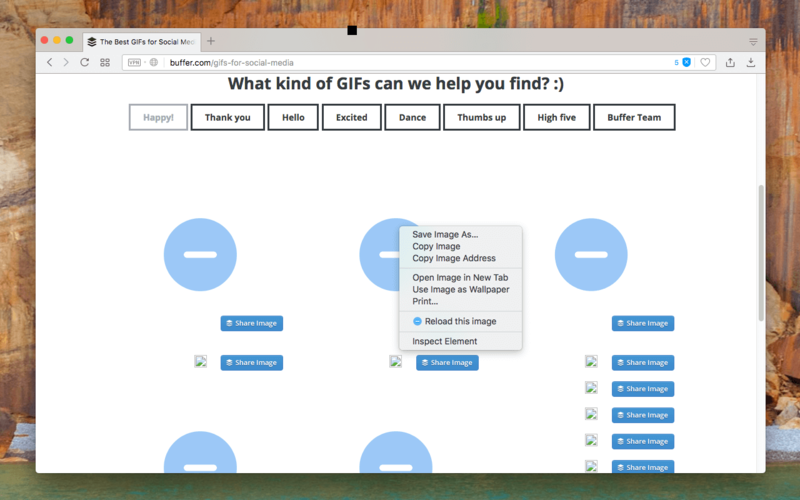 This will save your bandwidth and the page will use much fewer resources compared to when GIF images are loaded. This type of animated image uses a considerable amount of resource and usually degrades the browser performance. Using this extension, GIF images can be blocked by default. Still, the user can request loading of individual blocked images from the right-click context menu option. What is "GIF Blocker" extensions and how does it work? This extension adds an observer to the network manager of your browser with image filtering installed. This will filter out all images. The images that have GIF mime type are being redirected to a local vectorial image which looks like a blue forbidden sign (take a look at the screenshot as an example). This prevents websites from loading GIF images by default. Still, the user can request image loading from the right-click context menu item that is added when right-click occurs over a GIF image. This extension improves page loading speed as normally, GIF images are huge in size and also reduces tab's resource usage considerably. To be more precise GIF images are a series of normal images that are being shown in sequence after a time period and hence browser needs to render the image area constantly. By blocking these images, the performance of your browser will be enhanced. How can I load a blocked GIF image? Simply right-click over the blocked image and press the newly added "Reload this image". When this item is selected, the forbidden icon starts to blink. When the GIF image is fully loaded, it will replace the forbidden icon. Can I disable the extension entirely for a while? Yes, sometimes on some web pages, GIF images are loaded as a background of the page or a section of a page. Since these are not actual image elements, there will be no item on the right-click context menu to reload them. In this case, press the toolbar button once to disable the network observer entirely. Now refresh the tab and GIF images will be loaded normally. Note that the toolbar button disables the extension entirely. To re-enable the extension press this button once more.